About 1875 kids, women, elderly people & freedom-fighters of #Gaza have achieved martyrdom. About 66 barbarian Israeli soldiers go to Hell. Inhumane #CNN reporting terms murder of Palestinians in #Gaza by IOF as "civillians bearing the brunt"
We've posted 60+ photos to our facebook page from Aug.4 rally for #Gaza : tinyurl.com/mh9heut . #FreePalestine ! 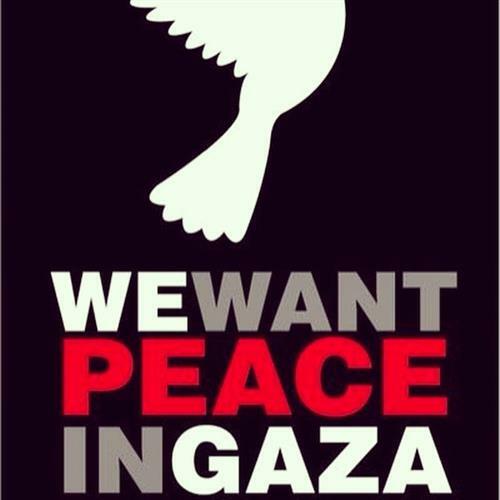 It's about time to deactivate my account as a protest against the Israeli genocide in #Gaza . Let me finish my dinner first. A wounded baby receives treatment at #AlShifa hospital in #Gaza .. after being injured..
We must say loudly " No ceasefire without justice for #Gaza , we will not back to slow death scenario "
UN Chief 'alarmed' by Disappearance of Rockets Found at #Gaza School mashable.com/2014/07/23/u-n… ~seriously? What a bloody joke, literally!! No where like home even though in a neighborhood which been bombed by israeli warplanes, artillery and navy shells. Aplaudo decisión de @MashiRafael de suspender viaje a Israel por genocidio en #Gaza . Lástima, eso sí, que calle sobre los abusos de Hamás.